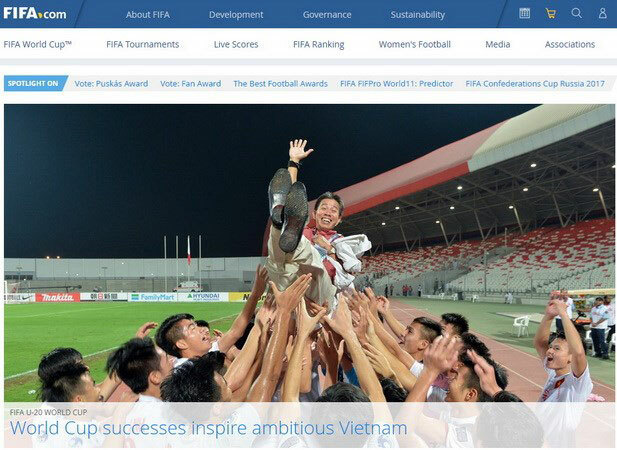 The International Football Federation (FIFA) website has run an article lauding achievements of Vietnam futsal and U-19 teams, said Vietnamese Football Federation (VFF) on January 3. Vietnam defeated Japan in the quarter final at the AFC Futsal Championship 2016, earning a ticket to the World Cup Futsal 2016. Meanwhile, U-19 Vietnam has won a ticket to the U-20 World Cup 2017. “In Asia, qualifying for a FIFA tournament has long been regarded as a major achievement. New contenders have emerged over recent years. Among these fast-developing football nations are Vietnam, who twice made history in the past year by qualifying for two FIFA competitions for the first time,” said FIFA website. “First of all, the Vietnamese stunned even their own supporters by finishing among the top four in last February’s 2016 AFC Futsal Championship to reach the 2016 FIFA Futsal World Cup Colombia,” it said, adding they went on to wrap up a memorable year by qualifying for the prestigious FIFA U-20 World Cup, which will be held in Korea Republic next year, with an impressive preliminary campaign that included an unexpected victory over the tournament hosts, Bahrain. Le Hoai Anh, General Secretary of the VFF said that U-20 FIFA World Cup is approaching and the Vietnamese team is trying to have their best performance for the competition. The U-20 team is expected to start a new success era for Vietnam football./.